We here at Mountain Colors are enjoying the beautiful Fall weather. The trees are turning yellow, the gardens have been harvested and we've had our first hard frost of the season. It's time to think about knitting and staying warm. 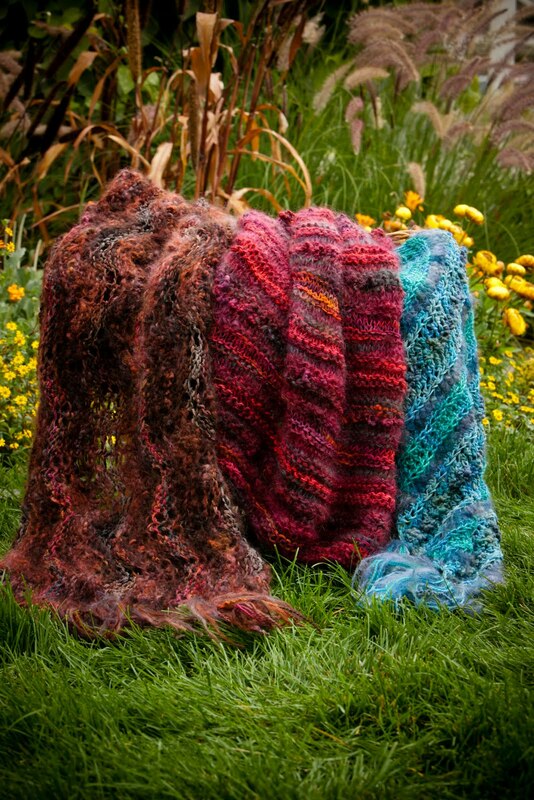 In celebration of this season we are have an Autumn promotion that features our new Warm & Wooly Throw Trio kit. It comes in 8 colorful colorway combinations and includes the patterns for three different designs. There is a pattern for an easy knitted throw, an intermediate lacey knitted throw design and a pattern for a crocheted throw too. Each kit includes THREE of our colorways in an assortment of our yarns....Mohair, Moguls, Mountain Goat and Merino Ribbon. These throws will make great Christmas gifts and beautiful home accents. Order yours today! !